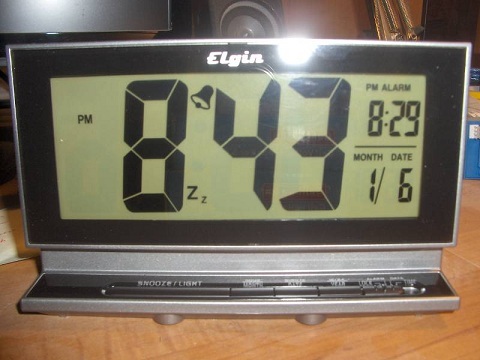 At the end of the last article, we had chosen an Elgin 3350E alarm clock, picked out some rechargeable nimh batteries, and selected a solar panel and diode. 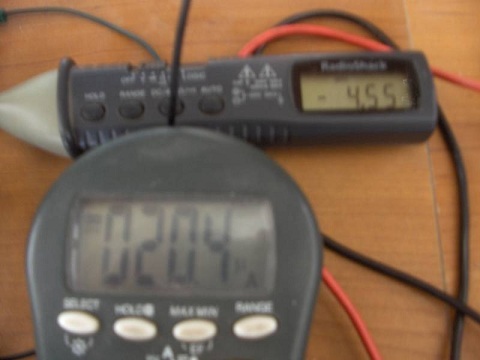 Now, we dive into some testing that really isn’t totally necessary, but it is fun for us electronic geeks out there, and it will give us an idea of how often the clock will need to bet set in the sun to recharge. With the alarm clock out of its packaging, it was time to try it out a bit. 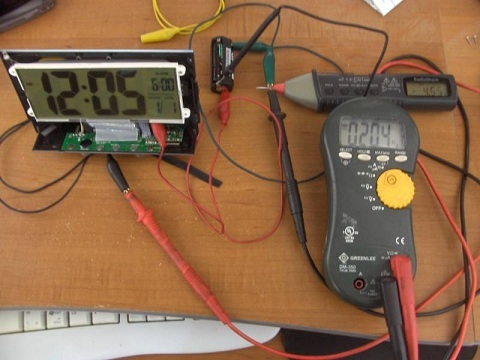 So, I grabbed some batteries and threw them into the clock. It is a very basic clock. 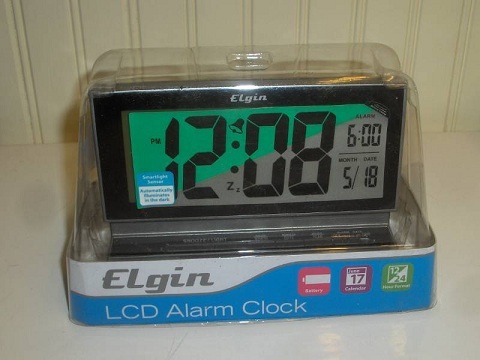 For features, it has one alarm, the date, the clock, and an automatic backlight that only turns on in the dark. Everything works as expected, there is a little photoresistor on the back side that senses when the backlight needs to be turned on. Interesting enough, it doesn’t just turn the backlight on/off. It actually does dim up and down as it gets brighter/darker in the room which is pretty cool and an additional power saving feature for the power saving feature. Alright, onto the geeky stuff. The main reason for tinkering about here was to find out how much power the clock consumes. 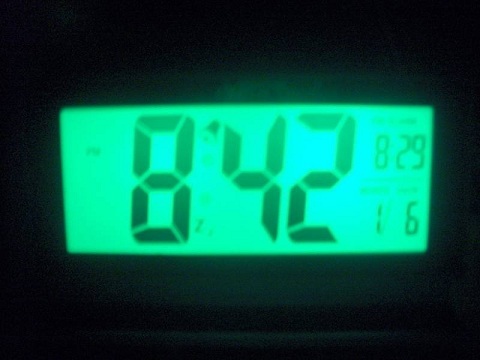 So, I hooked up two multimeters to the clock. One measured voltage and the other was set to measure current. With the clock just running in normal daylight (no backlighting), it uses a pretty low 20uA (microamps) at 4.55V. Next up was testing with the backlight on. Not too surprisingly, the backlight adds a lot to the power consumption. With the backlight on, we get a power draw of 234 uA, an 11X increase! Now it makes sense why those solar alarm clocks don’t have backlighting like this one does. Still, those are pretty low power draw numbers. 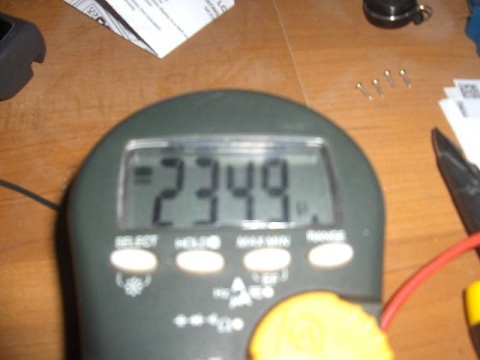 The nimh cells that I will be using in the clock are rated at 2,200 mAh, or 2,200,000 uAh. Even with the backlight lit 24/7 it should theoretically power the clock for over a year. For us, this just means that the solar panel doesn’t have to do much to keep up which is a good thing. A few hours of sun a month should be enough to keep this thing running and happy.